In this chapter, flaws of the existing methods (Li et al. in Iran J Fuzzy Syst 9:93–110, 2012 , Nan et al. in Int J Comput Intell Syst 3:280–289, 2010 , Li et al. in Intell Fuzzy Syst 26:2899–2912, 2013 , Nan et al. in Int. J. Fuzzy Syst. 16:444–456, 2013 ) for solving matrix games with intuitionistic fuzzy payoffs (matrix games in which payoffs are represented by intuitionistic fuzzy numbers) are pointed out. To resolve these flaws, new methods (named as Ambika methods) are also proposed to obtain the optimal strategies as well as minimum expected gain of Player I and maximum expected loss of Player II for matrix games with intuitionistic fuzzy payoffs. 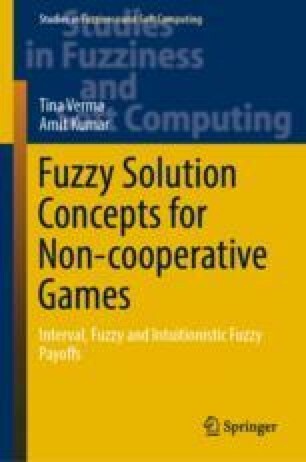 To illustrate proposed Ambika methods, some existing numerical problems of matrix games with intuitionistic fuzzy payoffs are solved by proposed Ambika methods.